Grilling Pork Loin Roast, How To Grill A Boneless Center Loin Roast. 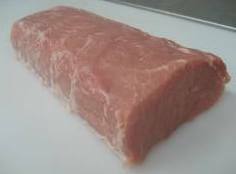 The boneless pork loin center roast is part of the pork loin that lies between the sirloin end and rib end on the loin. The loin comes form the area on the pig between the front shoulder and the beginning of the back leg. Although a center roast with the bone is somewhat more juicier with a little more flavor, the boneless roast is easier to cook and carve. The center portion of the loin is leaner than the rib end of the loin, which can easily dry out if overcooked. A brined pork roast with a dry rub will cook up juicier with more flavors, so if your pork roast is not enhanced or seasoned we recommend brining the roast before cooking. 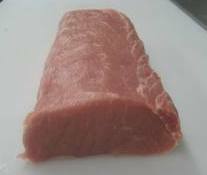 Read this to learn more about enhanced or seasoned pork. Enhanced or seasoned makes for an easy pork roast. 1. 6-8 hours before grilling pork loin, dissolve ½-¾ cup of kosher salt or 5-6 tablespoons table salt in 3 quarts(2.8 liters) of cold water in a large container. Place pork loin in the saltwater mixture, cover and refrigerate 6-8 hours or overnight. If your roast is enhanced (seasoned) or if you don’t want the roast brined in salt skip step 1. 2. Remove roast from the brine 1 hour before grilling and let the roast stand at room temperature. Rub the roast with olive oil and sprinkle with your favorite dry rub. You can also make several shallow incisions around the surface of the roast and place thin slivers of garlic in each incision. 4. Leave primary burner on high and turn off all other burners. Place roast fat side up over the high burner searing 3-4 minutes with the lid down. Turn over and sear the opposite side another 3-4 minutes with the lid down. 5. Move roast to cooler side and grill pork loin with lid down over indirect heat, depending on the size, the pork loin cooking time should be about 30-45 minutes until a instant-read thermometer reads 135-140 degrees into the thickest part of the roast. Try to keep the temperature inside the grill around 375-400 degrees. 6. Transfer grilled pork loin roast to cutting board, tent loosely with foil 15-20 minutes. The internal temperature should rise another 10-15 degrees. Any internal temperature over 150 degrees will begin to dry out the pork roast. When using a charcoal grill the roast does not need to seared. The internal temperature will reach 425-450 degrees inside the grill, enough to give the loin roast a nice crust over indirect heat. 3. For an optional smoky flavor you can use wood chunks or wood chips. Soak two 3 inch wood chunks in water for 1 hour and drain. 4. Meanwhile light a fire filled with charcoal briquettes and allow to burn until covered with a thin layer of gray ash. Move coals to one side of the grilling piling 2-3 high. Open bottom vents completely and place wood chunks or chips on top of charcoal. Place grate back in place, open lid vents halfway and heat 5-10 minutes. 5. Clean grate with grill brush. Place pork roast opposite side of the fire, closer to the fire than the outer edge. Grill covered, depending on the size, the pork loin grilling time should be about 30-45 minutes until an instant-read thermometer reads 135-140 degrees into the thickest part of the roast. 6. Transfer roast to cutting board, tent loosely with foil 15-20 minutes. The internal temperature should rise another 10-15 degrees. Any internal temperature over 150 degrees will begin to dry out the pork roast. Below is a cooking chart for grilling pork loin roast. Remember you should always use an instant-read thermometer to check the doneness of a roast. The internal temperature will rise about 10-15 degrees during resting time, remove the roast 10-15 degrees before desired doneness.